Pad Thai is a true taste of Thailand and an immensely popular dish with both locals and tourists alike. 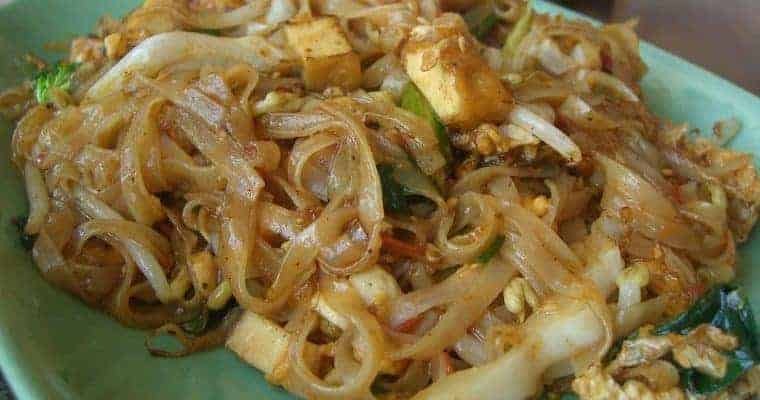 This version of the famous Pad Thai recipe, I hope, will provide a totally authentic experience and will reunite you with the taste sensations of those Hawker stands of Bangkok. Each Hawker obviously believe their Pad Thai to be the best and bring to the recipe their own culinary flair, their own favored flavors and therefore each plate of Pad Thai is unique! This version, and I do believe a firm contender, comes from the testing and tasting of many, many,…many… different variations from the food carts scattered across the city. We have done the research. All on your behalf 🙂 … It is no hardship. Pad Thai, I believe is Thailand’s ultimate street food. It is an internationally recognized and loved South East Asian dish very much like Nasi Lemak or Char Kway Teow from the streets of Malaysia and almost as well known as the Chow Mein of Chinese cuisine. To some people “street food” may not sound desirable. However I guarantee those food cart cooks stir up dishes worthy of the best restaurant menus. If you have been to Asia you will remember food stalls on every corner. It therefore stands to reason that with so many stalls and consumer choice, these cooks need to be good to be competitive if they are to remain in business. Usually this means they become specialist chefs of one or two dishes such as Pad Thai or Pad Kra Pao Gai. Many of these street side cooks have been cooking the same one or two dishes day after day. Many year after year and often generation after generation … they are therefore constantly perfecting it. What Makes A Great Pad Thai? To truly achieve Pad Thai excellence is to ensure a dish that is dry and light bodied. It has fresh balanced layers of flavor. The many ingredients, when first considered, could potentially put people off making this dish at home. Do not be intimidated. Many are optional. I recommend using them all if you want to create a truly authentic dish. Simply work your way through the recipe steps and in no time you’ll be enjoying the exquisite tastes of Thailand. Pad Thai is an easy to make stir fried noodles dish with rice stick noodles, shrimp, fried tofu, peanuts in a Pad Thai sauce made of fish sauce, vinegar, sugar and chili powder. This is a traditional and authentic homemade recipe. A True Taste of Thailand. Start by soaking the dry noodles in lukewarm water while you prepare the other ingredients. Getting the noodles right is possibly the trickiest part of making Pad Thai. Make sure that the noodles are totally submerged in plenty of water. By the time you are ready to put ingredients in the pan, the noodles should be flexible but not mushy. Julienne the tofu into 1 inch long matchsticks. You are aiming for the firm tofu to have a mozzarella cheese consistency. In a wok heat the oil until almost smoking. Drop in the julienne Tofu and fry until golden a crisp. Remove from the oil onto kitchen towel. Cut the Chinese chives into 1 inch long pieces and set aside a few fresh chives to garnish the final dish. Rinse the bean sprouts and divide equally. One half for cooking and one half for serving fresh. Mince the shallot and garlic together. Heat the wok again to a high heat with the same oil. Fry the peanuts until toasted, remove and place with the tofu. To the hot oil add the minced shallot, garlic, preserved turnip and stir until they start to brown. Drain the noodles well and add to the hot wok. Stir quickly to keep things from sticking. Add the tamarind, sugar, fish sauce and chili pepper and stir briskly. Keep the heat on high. You want to hot fry...not stew the ingredients - if you see liquid form turn up the heat! Push the noodles to the side of the wok and crack the egg onto the clear wok. Mix vigorously to scramble the egg until it is almost all cooked and then fold the egg into the noodles. Test the noodles by pulling a strand out to taste. If the noodles are too hard and not cooked add a little bit of water. You are aiming for soft yet chewy noodles. When the noodles are at your preferred texture add the shrimp and stir with a sprinkle of pepper. Add half the bean sprouts, the crispy tofu and the chives. Stir a few more times. By now the noodles should be soft, dry and very tangled, and intertwined with the other deliciousness. Serve onto your preferred plates and sprinkle with ground pepper and the roasted peanuts. Serve hot with the banana flower slices and a wedge of lime on the side. Garnish with the remaining bean sprouts and chives. Dress with your favorite Thai condiments such as sugar, chili pepper, vinegar and fish sauce - for your personal taste. Enjoy!